There are a million examples of bad PowerPoint slides, but this one is special. Understanding why it's bad is like unraveling a Mobius Strip. Get to the end, and you're back at the beginning - kind of. 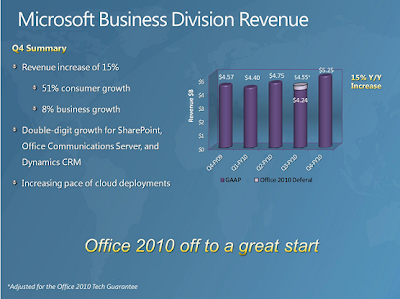 The worst bit is obviously the line "office 2010 is off to a great start"
"Office 2010 should be taken out the back of the chemical sheds and shot"
Go to http://www.lillilooloo.com to see thousands of management consulting templates. Most are pretty good but many are like your Microsoft example - shocking. Many managers think that complex issues can be shown on a single PowerPoint slide. Then, based on this simplified view, decisions are taken. I'm afraid that in some cases this is quite risky.. Sometimes being simple is very difficult!!!! it not bad.. it depend upon the people who used power point.. power point is the most comfortable presentation..
Aw, just explain in excruciating detail why you hate it so much! It'll make my day!